Within the first 20 minutes of my morning, without fail, I perform a sacred ritual. Be it French pressed or filtered, percolated or plunged, machined or dunked, I pay homage to life by partaking in that glorious gift to humanity, coffee. While I've waved poetical at Eureka Street in the past, in a piece appropriately named 'Sun rituals', I want to publicly thank Kaldi, an 11th century Ethiopian goatherd, who is said to have observed the lively conduct of his charges after munching on coffea arabica. Although some of my European ancestors were subsequently slow adapters to my drug of choice (coffee was dubbed the 'bitter invention of Satan' and condemned by some clerics), coffee gradually gained a breakfast foothold alongside the morning cup of tea, usurping beer and wine as the wake-up tipples de jour. And significantly, of the 16.3 million cups of coffees we drink on any given day, about a third were 'real' (from ground coffee beans) and two-thirds were instant, from powdered pretenders. I note that because the sharing of coffee is a largely unrecognised communal sacrament of sorts; that ABS statistic suggests the patronage of cafes across the nation. I should declare, in penning this paean, that I receive no murky kickbacks from Lavazza, Vittoria or Grinders, nor am I on a gravy (latte) train with any baristas or café proprietors. I am, however, partially indebted to that cup of kindness for my social health. Moderation, as is said, is at play in everything, and three daily cappuccinos is my limit, as I would be bankrupt if I walked out the door to purchase every caffeinated beverage I pursued. But without that social communion with friends and baristas I would be the poorer spiritually. "I'm not suggesting that all would have been rosy for those lab rats if given a double espresso and a chat. But I reckon it would have ceased the torture." But as well as the contested space around coffee's possible physical health benefits (impacting diabetes, Parkinson's disease, liver cancer and liver disease, heart health, providing antioxidants and possibly mitigating against 'mild cognitive impairment') and purported dodgy effects (possible anxiety, depression, cardiovascular damage, high blood pressure, disrupted body clocks), going for a coffee is good for the soul. Humans, like other species, are social creatures, and coffee lubricates our communing. Over a cuppa I have shared hardships, counselled and been counselled on relationships, listened to takes of brokenness and celebrated the wins that punctuate our travails. The deleterious impact of isolation — that friendless, caffeine-free zone — can alienate us, heighten our blood pressure and increase the likelihood of developing Alzheimer's disease and dementia. Alienation also leaves us more vulnerable to infection, reduces our attention and our capacity for logical and verbal reasoning. If that sounds overly melodramatic, consider the 1950s CIA-funded research in Montreal, where paid volunteers were isolated and sensorily deprived. Monotony and hallucinations ensued, as did decreased mental performances. The BBC followed up the lonely freakfest research in 2008, isolating six volunteers for two days in 'sound-proofed rooms in a former nuclear bunker'. Those companionless, caffeine-deprived volunteers 'suffered anxiety, extreme emotions, paranoia and significant deterioration in their mental functioning' as well as hallucinations such as 'a heap of 5000 empty oyster shells; a snake; zebras; tiny cars; the room taking off; mosquitoes; fighter planes buzzing around'. I'm not suggesting that all would have been rosy for those lab rats if given a double espresso and a chat. But without unduly belabouring the point, I reckon it would have ceased the torture. Because that's what isolation, what loneliness, is to social creatures such as we humans. The torture of disconnection. Just as 'companions' (literally those with whom we share or break bread) serve to keep us all grounded and sane, so too my coffee klatch serves to help me stay human. To share and laugh, commiserate and share stories. I think of Chappy, Ricardo, Neville, Mistress Katya, Denny and Rocky*, coffee comrades past and present who have trudged down streets and lanes with me over the years, sitting and sipping and enriching my life. I mentally conjure baristas such as George the Greek, Lee the Lebanese, Gwen the Goth, Mariana the Neuroscience Student* who have served us with adept skill, recalling birthdays and deceased loved ones, gossiping with impunity and contributing to my sense of reality: my role as a member of their community. So raise a mug to the joyful Java; that cup of Joe that seals our chronicles. The cup nonpareil that stimulates laughter, enhances clarity of thought and piquancy of putdown, and facilitates the confessional of boon companions. *Names have been changed to protect the caffeinated and caffeinators. The analogy of Sacred Rite of Communion [The Sacred Bodyand Blood of Our Blessed Saviour] with mundane coffee is uncalled for-the comparison between both gatherings is mammoth certainly salvifically. A grossly forced metaphor-blind to profoundsalvific context of Holy Communion. It's certainly a less lonely world when we can meet friends for coffee and have a talk. That's about the only time I enjoy a coffee, being a dedicated tea drinker at home. I'm also partial to a malted milkshake, vanilla flavour but that doesn't sound as exciting as an espresso! Coffee for breakfast is continental and of very recent practice in Australia, as elsewhere in the Western world. It was introduced here, as elsewhere, by the Catholic culture of Italy, which makes the headline of this article all the more ironical. It oughtn't to be observed that most coffee consumption at breakfast in Australia is the very opposite of a shared sacrament: it is done precisely as a personal ritual with little or no sense of communal engagement. Very succinct and to the point. I recently purchased a Lavazza expresso machine and I now get out of bed (80yrsold) with pleasure and joy at making and consuming my one coffee of the day. I have used Lavazza in it's many forms for years so understood exactly what you opinioned. Love your articles as all the other more serious subjects. Keeps the mind oiled for the rest of my life. And as we Australians enjoy our daily coffee (s), it's worth considering the importance of choosing a fair trade blend wherever possible, knowing our daily ritual benefits others who toil hard to produce this glorious gift. Yes. I can drink good old Nescafe instant coffee, strong, at 0.4 cents a cup yet in a symbol of the affluenza of our age the young especially line up at coffee bars so they can spend ten dollars a day on two cups of caffeinated foam. I am fascinated by Fr George`s reflex response. What do conservatives really think a sacrament is? A"rite"; like circumcision? If a morning sojourn to the coffee shop can make us feel grateful to our God and closer to out Lord, makes us kinder, more meek and loving; perhaps it is getting close? Most weekdays at 10:00am I gather at my workplace with a few others for coffee. Our group includes a Muslim, a Reformed Christian, a Baptist (myself), a Hindu, a lapsed Sikh and an agnostic. Drinking coffee is the ritual that brings us together to share our lives each day. Three daily cappuccinos is a lot of milk and about 300 calories, Barry! 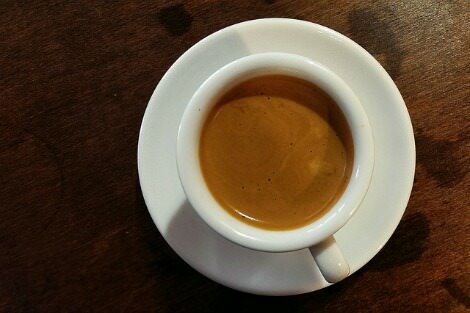 Expresso/Espresso/Short black is preferable; it's the drug in pure form.
" .... first twenty minutes ... sacred ritual ...." ".... most coffee consumption at breakfast in Australia is the very opposite of a shared sacrament: it is done precisely as a personal ritual with little or no sense of communal engagement." "...Fr George`s reflex response ...." If prayer is quiet time thinking about the things of God, does the space that the breakfast lack of engagement provides to mull over whether Fr George's response is a 'reflex' contain a prayer? The Sunday Eucharist is reenactment of Calvary in an unbloody manner. Coffee breaks revive spirits not win eternal salvation!